Partial bypass configuration, help eliminate airborne contaminants (dust, pollen, dust mites, allergens, odors, chemical fumes, chemical gases, etc) passing through your HVAC system, and provide clean, filtered air for large spaces or the entire home. Attic / Ceiling Installation – Space saving, efficient air filtration for one or multiple rooms. Standalone Units – Best results for one room and other smaller areas. 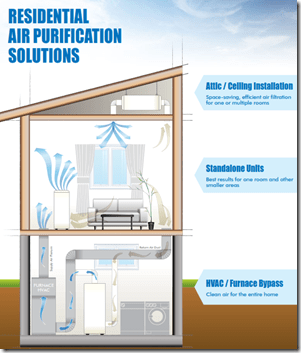 HVAC / Central Air / Central Heating / Furnace Bypass – Clean air for the entire home or office.